Born on November 28-th, 1977 in Vitebsk. Graduated from the Law Faculty of the Belarusian State University with honours in 1999. From 1999 to 2003 she took a postgraduate course at the Department of Criminal Procedure and Directorate of Public Prosecutions (Belarusian State University, Law Faculty). 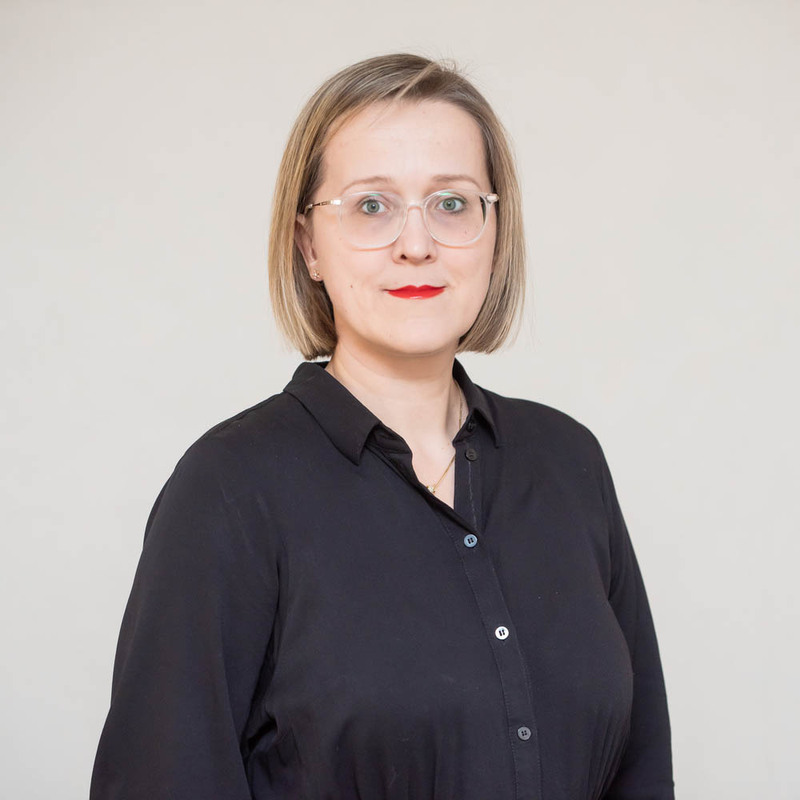 Since 2003 she has been with the Department of Criminal Procedure and Directorate of Public Prosecutions (Belarusian State University, Law Faculty) as a junior lecturer, lecturer, associate professor. Defended the thesis “Protection of human rights and freedoms in the Criminal Procedure of the Republic of Belarus” in November 2003 and was awarded a PhD (Candidate of Sciences) in Law. In 2013-2014 was a national expert within joint UNDP/UNICEF/UNHCR project "Facilitating the Improvement of the Court System in Belarus through the Development of the Specialization of Courts" (field of expertise – final assessment of the perspectives of implementation of the Conception of the improvement of the court system of Belarus through the development of the specialization of courts, including drawing up national plan of actions, social work and psychological assistance at the Juvenile Justice system and Family Courts). Her scholarly interests are connected with the criminal procedure, restorative justice, mediation in penal matters, legal and forensic psychology, investigation of child abuse cases. She published more than 80 scientific papers. 28/03 -31/03/2012, University of Wroclaw, Wroclaw, "The Principle of Transparency of the Criminal Procedure of the Republic of Belarus"
Theoretical bases of the complex of legal phenomenon of the protection of human rights and freedoms in criminal procedure of Republic of Belarus is studied in the book. The study provides further development of legal coordination of the protection, new criminal procedure legislation applied in accordance with international legislation. The authors have developed new initiations for perfection of legal norms regulated through guarantees of protection of human rights and freedoms by activities of court and criminal prosecutors in criminal procedure of the Republic of Belarus. Criminal Procedure in Schemes. General part: Coursebook / A.A. Danilevich, O.V. Petrova, V.I. Samarin. Minsk, 2013. 124 p. (in Russian) / Данилевич, А.А. Уголовный процесс в схемах. Общая часть : учеб.-метод. пособие / А.А. Данилевич, О.В. Петрова, В.И. Самарин. – Минск: БГУ, 2010. – 136 p. – ISBN 978-985-518-316-8. The coursebook presents the general part of the discipline "Criminal Procedure" in the form of charts: theoretical concepts and principles of criminal procedure, the legal status of participants in criminal proceedings, measures providing the safety of participants of the criminal procedure and other persons. The authors also define the provisions of the law of evidence, the grounds and procedure of enforcement of coercive measures, procedure for examination of a civil claim and other provisions. Guarantees against Personal Rights Abuse in Criminal Procedure / A. A. Danilevich, O. V. Petrova, Law and Democracy, 2008, Iss. 19. рр.256-270. (in Russian) / Обеспечение добросовестного использования прав участниками уголовного процесса / А. А. Данилевич, О. В. Петрова // Право и демократия. – 2008. – Вып. 19. – С.256-270. The article deals with the issues of good practice of application of rights of the parties to criminal procedure. The specificity of the human rights abuse in criminal procedure is defined. The authors reveal the means of protection against such abuse. The importance of criminological inspections of normative acts as well as individual practice of officials involved in criminal procedure for protection against maladministration of personal rights are underlined. Preventive measures are studied as the means for providing good performance of the parties involved in the procedure. Special attention is paid to the analysis of the means to secure protection of the parties who cooperate with justice as a means of protection against abuse of personal rights. The authors conclude that the restriction of human rights is possible but extra guarantees of the rights of the accused or other persons involved shall be applied. New Methods of Drug Treatment as the Alternatives to Criminal Punishment /O. V. Petrova, Law and order. 2010. #1. рр.51–54. (in Russian) / Новые формы организации принудительного лечения как альтернативы уголовному наказанию / О. В. Петрова // Законность и правопорядок. – 2010. – №1. – C.51–54. The article deals with optimization of drug, alcohol and toxic treatment in the criminal justice system. Drug treatment of abused offenders in foreign countries as well as functioning of drug courts are analyzed. The factors of the success of the procedure and focused on. The necessity of comprehensive management programs for addicted offenders being on probation (p.4 art. 77 and p. 5 art.78 Criminal Code) combined with therapy, counseling and social rehabilitation, and other means are proved. Drug treatment for people who were apprehended for the self-use possession of small quantities of illegal drugs is suggested as alternative to imprisonment. The author reveals the ways of a reconciliation programmes application in case of drug- or/and alcohol-addicted offenders. Procedural Guarantees of the Accused and Suspect and Restorative Justice / O. V. Petrova, Justice of Belarus. 2010. #12. рр.31-34. (in Russian) / Процессуальные гарантии прав обвиняемого и подозреваемого и восстановительное правосудие / О. В. Петрова // Юстиция Беларуси. – 2010. – №12. – С.31-34. The article deals with the issues of fundamental procedural safeguards in connection with the restorative procedure. The author researches the procedural concept of «the restorative justice». The specific rights and their violation are considered, namely: the right to equal protection by the law, the right to freedom from torture and cruelty, inhuman or humiliating treatment or punishment, presumption of innocence, the right against self-incrimination, the right to fair trial, the right to assistance of counsel, the right to protection against double jeopardy. The variants of these problems solution in international law and court practice in different countries are reviewed in the article. Termination of criminal proceeding by reconciliation between the accused and the victim and restorative justice / О.Petrova, The Judicial Bulletin, 2010, #3 pp.57-61 / Прекращение производства по уголовному делу в связи с примирением обвиняемого с потерпевшим и восстановительное правосудие / О. В. Петрова // Судовы весник. – 2010. – № 3. – C.57–61. The author analyzes relations between the public interests and the needs of victims and provides proves that they do not coincide fully. There is an emphasis on greater involvement of a victim in the reconciliation process in the Criminal Justice of the Republic of Belarus. The author shows the reconciliation as the basis of termination of criminal proceeding and provides examples of statements and reconciliations applicable in legal practice. There is informal mediation in the Criminal Procedure of the Republic of Belarus. The outlook of implementation of restorative justice in Belarus is considered. Benefits of reconciliation programs for the interest of both a victims and the society are proved. The projects of implementation of restorative justice in the framework of juvenile justice are outlined in the article. 22 апреля 2019 г. – срок предоставления информации для проверки дипломных работ и магистерских диссертаций в системе «Антиплагиат» на кафедре уголовного процесса и прокурорского надзора. 06.04.2019г. - защита учебной практики (заочное отделение 3 курс) у старшего преподавателя Бурака Р.В. 02.03.2019г. - Защита учебной практики заочное отделение 4 курс у доцента Букато Л.Г.